As you all know my name is Wazwan which is served in Kashmir on special occasions, like on marriage ceremonies, on engagement ceremonies, on special functions and now also have the dubious distinction of being served in mourning ceremonies which is known as ‘Czoorim batta’. I myself am uncomfortable with being served on mourning ceremonies as I don’t at all fit in gloomy scenarios but tragically that is not in my hand. I am called ‘The Kings Feast’ and many modifications have been done to me which I don’t at all like but I being robust and rigid don’t at all let people make any modifications to the seven main dishes though there have been additions which change from time to time. Instead of humans, many times machines have taken over for purpose of grinding and mincing the meat but true to my rigidity, men are still needed to pound me. You should see the synchronized pounding (thud thud sound) with wooden Thor Hammer on a butcher block when scores of white clad and white capped junior Wazas sitting on ‘Wagu’ or ‘Patij’ (both are Kashmiri Floor Mats laid on the ground) and smoking the traditional ‘Jajeer’ or Hubble Bubble giving you that longing of festivity. My origin is dubious, some say I am from Iran, some say I am from Central Asia and some say I am indigenous also. When I am being cooked, people always talk about my origin but still no one is able to reach the conclusion from where I have originated but one thing is clear that in old times I was feast of nobility not of commoners like the present times. I am mostly made of lamb in Srinagar with some vegetables thrown in just for sake of it. Kashmiris have always taken me for granted with regard to time but have given me much love when it comes to making me with fresh slaughtered lamb and superb quality of spices and more than sufficient Ghee (Clarified Butter). The amount of ghee which is added to me is something which will put Haryanvis and Rajasthanis, the notorious ghee eaters cornered in a dark room. I am telling you all a secret as my collective conscience compels me to say it that the Wazwan is not the magic of Waza making me the thing I am but it is the perfect blend of open fireplace of wood, copper pots, fresh lamb meat, ghee and spices. Go figure out, this is my secret but hush hush…….don’t tell the Waza or annoy him in any way because it is in his hands that you have placed the responsibility of the feast. If the Wazas asks for Tea, give them as early as possible; don’t make them wait as their temper is directly proportional to how bad they will make the Wazwan. Well I don’t want to be called as being regionally biased but Srinagar and North Kashmir Wazas cook me better than South Kashmir ones, just taste me in Kamraz(North), Yamraz(Central) and Maraz(South) regions, you will notice it yourself. My foremost complaint with Kashmiris is that they have linked as well as cursed me with unpunctuality. You know how it feels after how much money, time and oily sweat of Waza is put in me and yet I am not served on time? It feels as that beautiful ornament clad bride into whom none is interested for a second look because everyone is hungry and ready to pounce on me. I being the Kings Feast have the luck of being garnished on copper platter perhaps the only time Kashmiris feel presentation of food is important. The Waza puts rice on the big copper plate known as ‘trami’ and puts the required mandatory starters for 4 people equally spaced. One elderly uncle, mostly a mamaji who takes the position on plastic chair near the waza puts napkin on the trami for it to look more decent (that napkin is also used to wipe hands at end of Wazwan). It doesn’t end there, they put a ‘Sarposh’( a copper covering) on me so that I remain covered till it reaches the white Dastarkhwan which is laid where guests are sitting. The white color of Dastarkhwan reminds me of the shroud in end I have to face which is the reality of life. In between the Wazas place and the sitting place of guests which is either a big hall situated mostly on the third storey of house (the only time when it is used apart from some sad demise of a family member) or a tent which either crewel clad or white house type. I have an exceptional relationship with the hall of the house as Kashmiris live to earn for these two things specifically. The hall otherwise remains mostly shut for rest of the time. OK, enough of hall and tent, I was going to say about how I reach the hall or tent from Wazas place as it is unique in itself as it may signify a political statement, I reach through human chains! I am being made political for no reason; this is how mischievous Kashmiri mind works! Also to increase publicity maximum photo ops happen during the kursi clad mamaji putting the fancy napkins on me till the human chain ends at the guests sitting place. As you know Wazwan is mostly associated with marriages which are uniting families together but I have an evil side too, I can break the families and friends. In this busy world when none has time to meet the FnF, it is only the occasions of marriage and some unfortunate death apart from the two Eids that FnF see each other and interact. As I am put on Dastarkhwan, helter-skelter takes place and I make sure only four of a group come and sit around me making others disperse and those who disperse into some random tramis sense a grudge but the show continues. If the trami is put along the sides of room/tent, then by convention the elder two sit along the sides and the younger two sit opposite showing values of Kashmiri culture. I forgot to tell you that during starters and napkin placing on tramis at the Wazas fireplace, another activity occurs at the sitting place and that is the laborious hands washing with Taesh-Naer where the young men are given the job of making the hands wash of guests. Guys when the hands are washed before the meal it is very easy but after meals it becomes tedious after me being devoured especially by women. I don’t know what it is with women when having me, they wash hands as if they will never be clean in future making the guy pouring the warm water bursting in anger but he keeps calm as the woman out of nowhere shows affection as the young boy may be some distant cousin’s son! This is a unique torture method, seriously! OK guys let’s get started but who will start! When the trami reaches 80% of people, all eyes begin to roll as question is asked to oneself that who is going to start and somehow somebody starts and rest follow them and their begins the cherished Bismillah! Now I am delegating the talk to my constituents who actually make me and they will speak now for themselves. Rice – I am rice, the staple food of Kashmiris, the thing which fills the Kashmiri tummies on routine days and even if how much junk food or bread a Kashmiri eats in day, until he eats the rice on dinner, he will be considered starved or ‘faqai’. Go figure yourself. Now coming to my role in Wazwan, I am the one which fills the trami and I being the medium through which people taste the curry otherwise I am not that much of a delicacy in Wazwan but I am useful in being drawn as boundary for the persons sitting in the trami so that the other person by not any chance encroaches in other territory and if the boundary begins to become weak, more rice is put to make it strong. There is a cliché; I am more eaten by women than men not out of love for me but out of love for family at home as most women carry the cooked meat delicacy in packets to their homes so that the family at home enjoys it. I am time to time being served during the course so that the trami never remains empty till the end whether it is change of gear from red curry to white curry or vice versa, I am being put by the service guys and mostly the elder guy in trami adds me to the four territories. I have a grudge too; no one puts me in the packets provided by host unlike my counterparts. Meethi – I am a misnomer now, I am actually Meethi Maaz with traces of meeth (fenugreek) only found. I am made up of pieces of stomach, intestines in ghee and I have the distinction of being the first dish to be tasted with rice opening the gate of stomach valves. 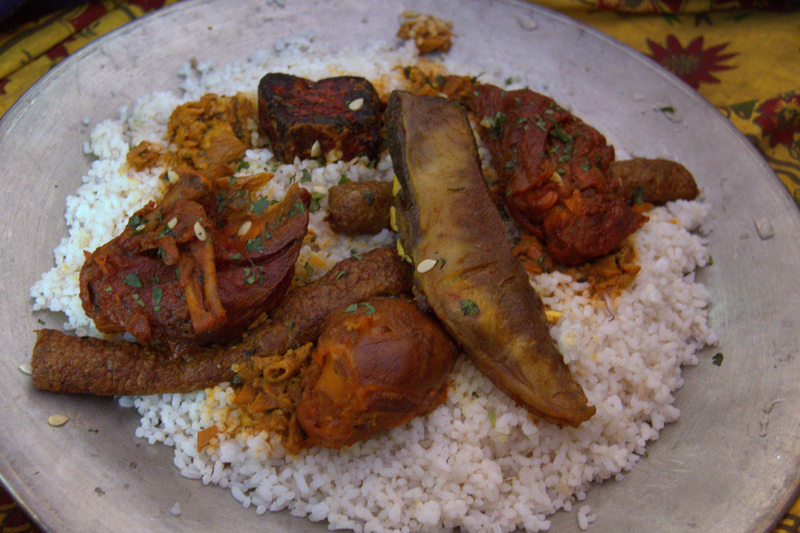 Methi-maaz is one of the first dishes on the platter. I am equally distributed and spaced on four sides of trami, in fact I am aligned such that all four people are adjusted and placed comfortably while eating me.